Paul Chamberlain was one of the first classical accordionists to graduate from the Royal Conservatoire of Scotland. His debut disc, Classical Accordion, was released in 2011 and featured a mixture of transcriptions and new music for accordion. On this new disc, Accordion Sensations, he performs transcriptions of music by Carl Maria von Weber and Scarlatti, plus music by Astor Piazolla and Vladislav Zolatriev (Zoltaryov), performed with the Maxwell Quartet and violinist Feargus Hetherington. Chamberlain opens with Carl Maria von Weber's Konzertstuck in F minor originally written in 1821, it is in four movements which run continuously and is explicitly programmatic, describing a young woman waiting for her husband to return from the war. Chamberlain's performance is simply dazzling, both in terms of the degree of speed and complexity, but also in terms of the subtlety he brings to the quieter moments. At times he manages to sounds as if he has three hands. The transcription manages to capture both the sustaining sense of the orchestra and the more percussive aspects of the piano. Chamberlain follows this with a pair of Domenico Scarlatti sonatas, Sonata in F sharp minor, K25 and Sonata in G major K 455. Both are nicely perky with some lovely even passagework and a fine neo-classical feel to the performance. Astor Piazzolla wrote his Five Tango Sensations in 1989 for himself to perform on the bandoneon (a form of concertina, popular with tango bands in Argentina) with the Kronos Quartet, here Chamberlain plays three movements (Asleep, Loving, Fear) on the accordion with the Maxwell Quartet. Asleep is a slow lyrical piece which develops into a slow yet complex texture. The accordion is to the fore, the strings are closely miked so that they sound like a larger body of strings. Loving is a throbbingly seductive piece, full of the sounds and rhythms we associate with Piazzolla, whilst Fear is a wonderfully rhythmic evocation. Vladislav Zolatriev was a Russian composer and bayan player (the bayan is a form of chromatic accordion invented in Russia in the 20th century). His Sonata No. 2 is a lovely neo-classical work which he originally wanted to call Symphony in the style of Haydn. The Allegro ingenuo is a delightful chattering sort of Haydn Allegro. The middle movement, Adagio tranquillo molto is slow and evocative (in fact it describes a sunrise), but with a nice spiciness to the harmonies. The final Vivacissimo con spirito is a lovely romp which gives Chamberlain the chance to show some nifty fingerwork. Piazzolla's Le Grand Tango was written for him to play with cellist Mstislav Rostropovich in 1982, fusing tango rhythms and jazz syncopations in an attractively exotic mix, here giving a spirited and vibrant rendition by Chamberlain and violinist Feargus Hetherington. 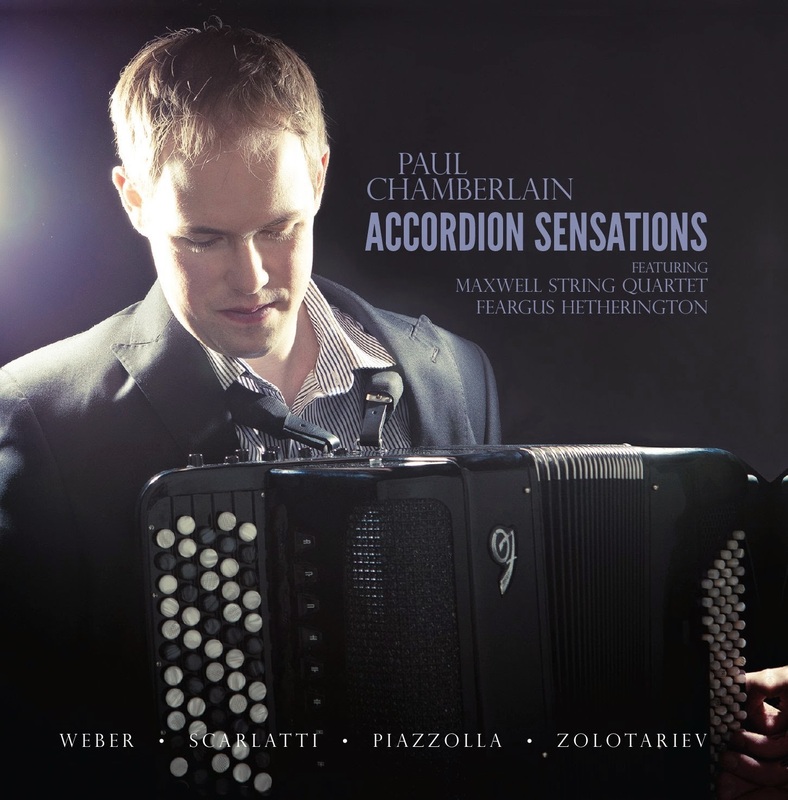 This is a fine disc showcasing both Chamberlain's talent and the versatility of the modern accordion. Perhaps the sound world of the instrument is something of an acquired taste and I was a little dubious at first but confess to being won over. So, do try it!